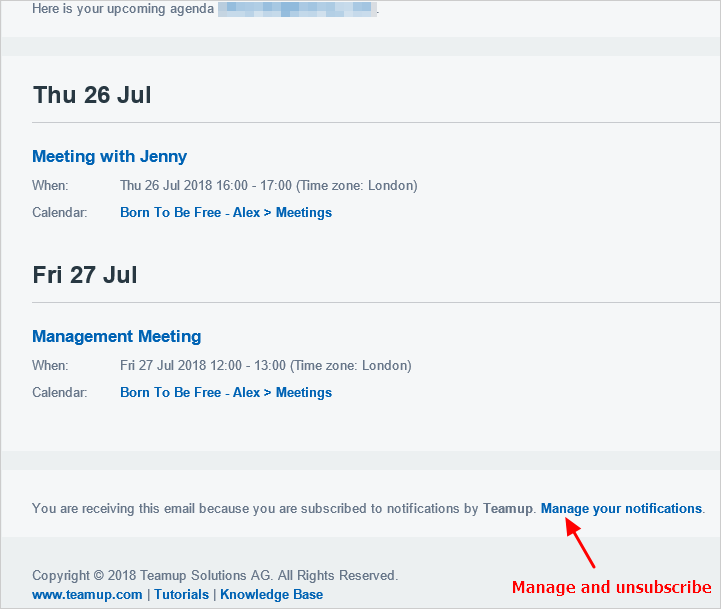 With Teamup Calendar, you can automatically have a Daily Agenda in your inbox each day. The daily agenda displays all events for the upcoming one to three days, and it is sent via email in the morning, or at the time of your choosing. Please note that a paid subscription plan is required to use this feature. The calendar administrator can allow all calendar users to sign up for Notifications, such as the Daily Agenda. Once notifications have been enabled (as outlined above), it’s easy for all calendar users to subscribe to the Daily Agenda. 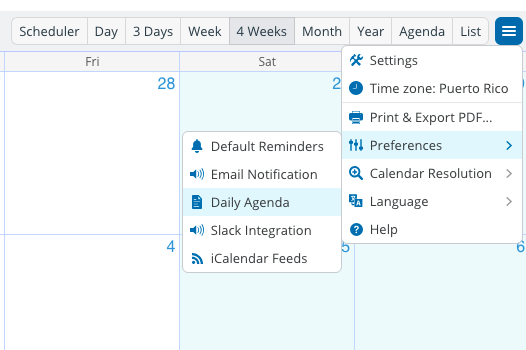 Go to Preferences > Daily Agenda to set up your Daily Agenda email. Choose the number of days to include. You can see events for the next 1, 2, or 3 days on each Daily Agenda email. Set the time you want the Daily Agenda email to be delivered. By default, the time is set to 4:00 AM. Note that if the delivery time is scheduled to be before noon, the current day’s agenda is delivered. If the delivery time is schedule to be after noon, the next day’s agenda is delivered. Select the sub-calendars that should be included in the email. Only events from selected sub-calendars will be included on the Daily Agenda email. The default setting is All sub-calendars. Note that if Daily Agenda is greyed out, it means the service has been disabled by the calendar administrator. Contact your calendar administrator to request that they turn on the notifications feature. You will receive your first Daily Agenda email the next morning. At the bottom of the Daily Agenda email (see above), click on Manage your notifications link to unsubscribe. 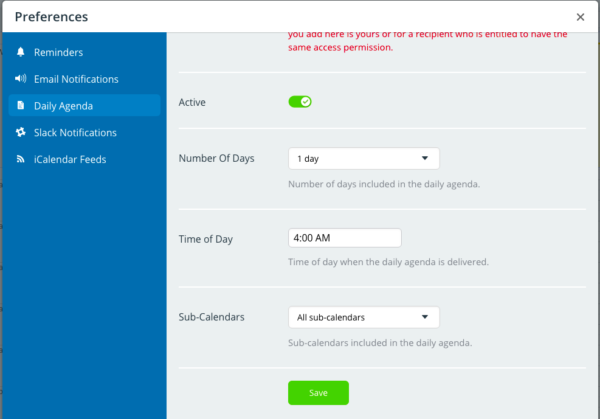 From there you can delete or modify your Daily Agenda subscription. Every Daily Agenda email contains the calendar link that was used to set up the subscription. 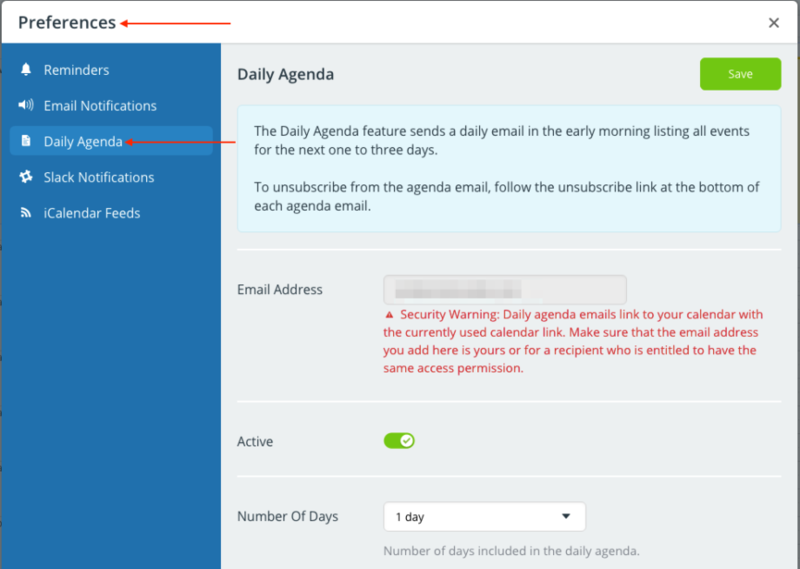 Make sure that the subscription for a specific email address is set up from the calendar link that the recipient of the Daily Agenda email is entitled to access. Do not set up Daily Agenda subscriptions from an administrator link for team members who are non-administrators. The event title from the Daily Agenda email is linked to the event page with the same calendar link. It is not recommended to forward the Daily Agenda email. If you do so, please think twice and double check if the recipients have the proper permission to access the calendar linked in the email. To be better prepared and stay organized for the days ahead. Keep a local email copy of your upcoming plans and schedules. Without needing to rely on a constant Internet connection you can easily access key information about upcoming plans and scheduled events. Organizations that use Teamup for business critical processes are encouraged to use the Daily Agenda as a data “backup.” This could give you peace of mind and the ability to avoid unnecessary operational interruptions in the rare case when you are not able to connect to the Teamup servers for whatever reason.